Would you like to provide some visual indication that a state has been added or removed? By default, when a state is added, there isn’t really any visual indication beyond a little icon in your party menu, or a little icon over the enemy’s head. If you’re using the side-view battle system, you could potentially add some side-view overlays to show the state. However, what happens if you have neither overlays nor icons? And there’s no message that says “State was added” or “stated was removed”? This plugin gives you the tools to play some animations when your state changes! Download ths plugin and place it in the “plugins” folder in your project’s “js” folder. Then open your Plugin Manager (F10), double-click an empty row, and select the HIME_StateChangeAnimations plugin. Where the ID is the id of the animation to play. A single state can have both add and remove animations. Still didn’t work at all and still lost. I added the plugin but nothing showed up, do you think it’s where it’s placed in the plugin loader that effects it, I did try Yanflys VisualStateFx to show animations but that did nothing, so turned it off and tried your’e one out but again nothing at all. Just confused as to why no animations are showing up at all. Hello, nice plugin but i cant make it work if i have a condition on the tag of the state too, like if the char is under 25% or something, the animation doesn’t play but the state still apply. Is there a way to make the animation play when the state apply too with this condition? How are you specifying conditions for states? Here is the code i am using for state. The state applies when the condition is met, but the animation doesn’t play. 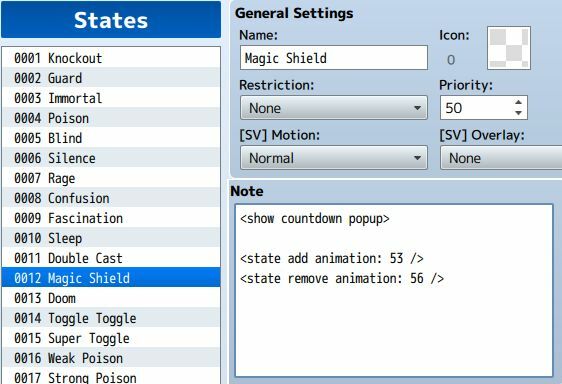 If i remove the code and put the state to activate by using a skill, it plays the animation normally. No, this state only shows an animation when you add or remove a state. A different plugin will be needed to change actor colors.